Free Shipping Included! Camp Mess Kit My Amazing Outdoor - Compact Portable Lightweight - Space Saver Camping cookware Set That is Stackable - Scouting Survival Hiking dishwear kit 18 pcs Includes Multitool Spork by My Amazing Outdoor Inc at Smart Survival Supply. MPN: MAOCMK00001. Hurry! Limited time offer. Offer valid only while supplies last. 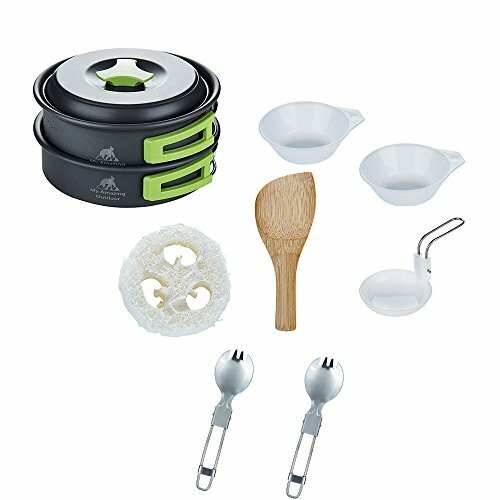 If you are an enthusiast about the outdoors, this is for YOU This camping cookware set is the solution for not carrying those bulky pots and pans. This camping cookware set is the solution for not carrying those bulky pots and pans. Everything you need is in just one bag. 100% SATISFACTION GUARANTEE ; Backed by our manufacturer 30 day money back guarantee with 1 year free replacement warranty. To avail of the warranty you must register your product with us. If you have any questions about this product by My Amazing Outdoor Inc, contact us by completing and submitting the form below. If you are looking for a specif part number, please include it with your message.